al-Malik, rebuilt and expanded the mosque. damaged by earthquake in 1927.
them which be in Judaea flee into the mountains..." (Matt. 24:15,16). Houteff identifies the final embodiment of the "king of the north" of Dan. 11:40-44 as the British Empire. 1947), "yet he shall come to his end (as an empire), and none shall help him." (Dan. 11:45). years to cleanse Israel from these heathen temples expired in 2007.
of Daniel 11:45 by God's people is in itself a warning to leave the cities. understand:) then let them which be in Judaea flee into the mountains..." (Matt. 24:15,16). the message, the destruction of the persecutors, and the deliverance of those who follow the message. Since persecutors love to persecute and God loves to deliver, this pattern will recur in the end time. down the truth to the ground; and it practised, and prospered." (Dan. 8:8-12). Catholic churches now keep only one daily service. Most Protestant churches don't keep the daily. hundred days; then shall the sanctuary be cleansed." (Dan. 8:13-14). by reason of transgression, and it cast down the truth to the ground; and it practiced and prospered." the abomination that maketh desolate."" (V. T. Houteff, "The Shepherd's Rod," Vol. 2, 1932, p. 130,131). thousand three hundred and five and thirty days." (Dan. 12:11,12). brought to light in 1844..."" (Ibid, p. 131). ground," and the "Abomination" (Sunday) "set up." church, and divinely predicted."" (Ibid, p. 132). reservations about Houteff's conclusions. Time has proved him right. be fulfilled again with the restoration of the Daily as it was fulfilled with the restoration of the Sabbath. the correct times) must be restored. the Daily in 1978. It was the culmination of studies given in 1977. (Ben Roden, "The Daily, Part 2, 1978, p.
Sabbath school lessons. Here is Ben quoting himself to summarize the gist of his teaching on the Daily. ""That time has come, and the answer to Daniel's vision of Chapter 8:11 is here. . ." – Ibid., p. 4." Lessons," Vol. 8, Nos. 1-3, 1978, p. 40-41). sun rose at 6 AM, the morning worship hour would be after the end of the second hour at 8 AM. Therefore the third hour would stretch from 8 AM to 9 AM. prophecy of Daniel. Let me tie it all together. Here is what Christ said. five and thirty days." (Dan. 12:11,12). 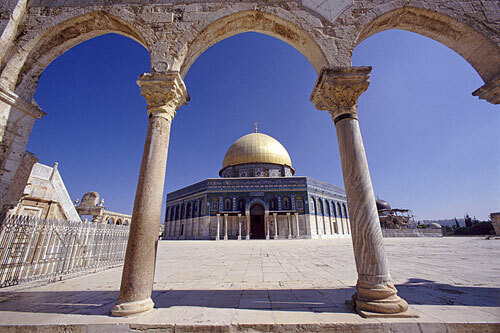 But the abomination on Temple Mount was not fulfilled until both "tabernacles of his (Islam's) palace"
not successful in restoring the Daily to Christianity, but that will also happen. cometh to the thousand three hundred and five and thirty days." (Dan. 12:12). take years, so this series of articles is one more warning to get out of the cities now. the holy places of Jerusalem.